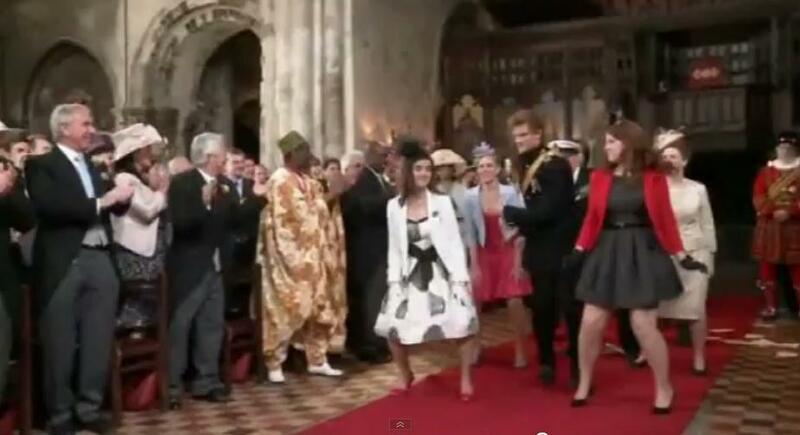 A week before the royal wedding of Prince William and Kate Middleton, T-Mobile created an ad in the form of a spoof video preview of the wedding entrance procession. The video went viral and drew millions of viewers. But it also created some spoofs of the spoof, including the klezmer version we found on YouTube and that we're sharing with you below. The original T-Mobile Royal Wedding video features 15 royal lookalikes, including the Queen, Prince Charles and Camilla, and Prince Harry, who dance their way down the aisle in a routine choreographed to the East 17 song, 'House of Love'. But as you can see, it's also an almost perfect fit to the Yiddish klezmer song Chosson Kalleh Mazeltov. Dressed in a ceremonial Army uniform, the Prince’s double disco-dances in the aisle, then joins doppelgangers of Princess Beatrice and Princess Eugenie for more moves before bending down for “William” to leapfrog over him.